Transportation technologies are making mobility more efficient and economical. Consumers’ increasing adoption of ride sharing services is shaping the future of transit, as is the Internet of Things. The mobility business is booming, and transportation startups are using Esri technology in their apps to connect people to one another and keep traffic moving. German startup Match Rider designed an app that matches people with a car pool heading in the direction they need to go. And drivers don’t have to go out of their way to pick up passengers. 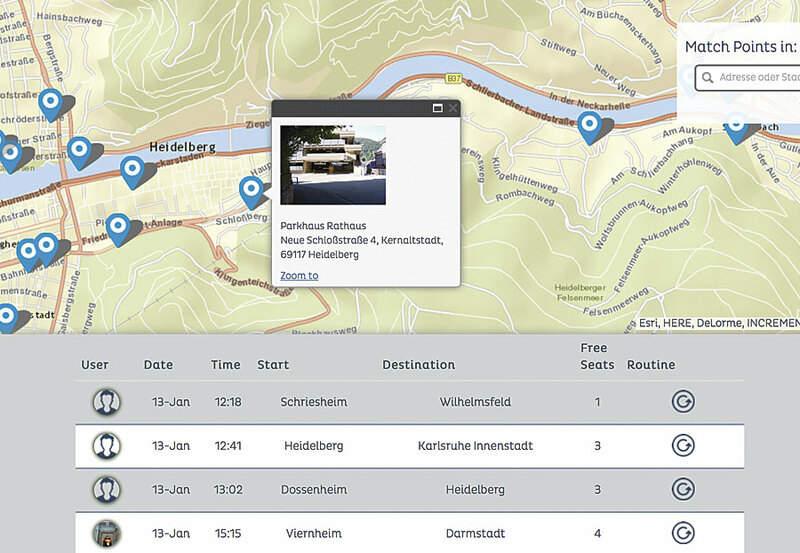 Match Rider shows a map with Match Points where drivers will pick up passengers. Participants can search for car pools within a 100-kilometer range. The app shows users a map with Match Points where drivers will stop to pick up passengers. The Match Rider system works like public transportation, with Match Points functioning like bus stops: A passenger clicks a blue Match Point dot on the map and sees a picture and description of the pickup spot. He or she then walks to that location to get a ride. Participants can use the app spontaneously or for routine rides. Passengers and drivers can rate each other after the ride, building trust and transparency among users. The service is currently free to use, and passengers pay their drivers the set fee for each ride in cash. The Match Rider platform, which runs on the web and on iOS and Android devices, is hosted in ArcGIS Online. Esri’s network analysis capabilities improve routing. By mapping population data, Match Rider can place Match Points where they are more likely to be used. In partnership with the University of Stuttgart, Match Rider is currently testing its service on busy commuter routes in the German city of Stuttgart. Cameras and sensors monitor traffic throughout the United States. Startup company MetroTech is aiming to improve traffic flow by putting this real-time data onto maps. Using MetroTech's technology, Santa Clara County has reduced stop-and-go traffic. Working with Esri, MetroTech is creating better datasets from this information and incorporating analytics into it. The company is enhancing traffic signal timing and communication with drivers—leading to improvements in people’s daily commutes. By employing ArcGIS Marketplace and technology from Esri partner OSIsoft, MetroTech can map real-time activity on roads and highways. 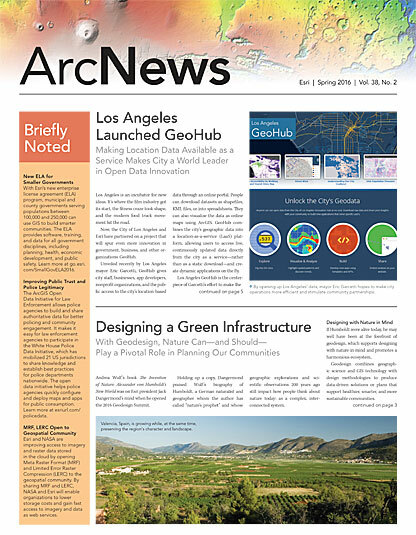 The company uses the PI Integrator for ArcGIS to stream sensor data to the Esri platform—specifically to ArcGIS GeoEvent Extension for Server. GeoEvent Extension sends those updates to a standard Esri feature service hosted in ArcGIS Online. The live-updating feature service can be analyzed and manipulated using powerful tools from Esri, including custom dashboards and live map editing. 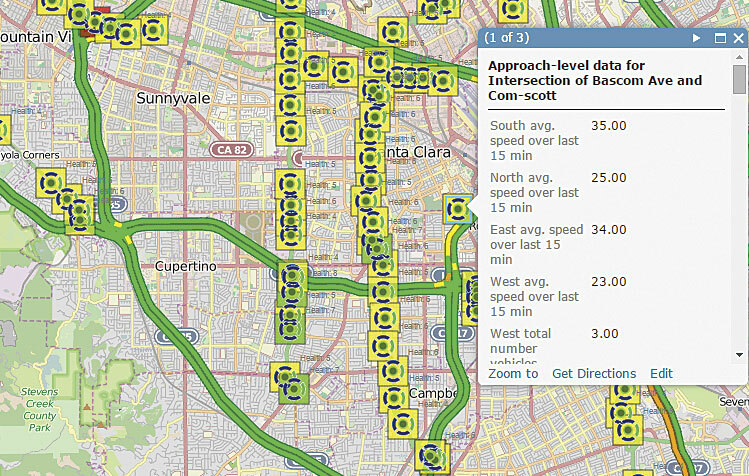 The data can be visualized as a live traffic web map, which helps immensely with orchestrating traffic management. MetroTech also uses Web AppBuilder for ArcGIS to create web applications that customers can use to access live maps and do traffic flow calculations on any device. Santa Clara County, just south of San Francisco, has implemented MetroTech analytics for more than 100 of its intersections. In just two years, MetroTech tracked 3.1 million turning movements (the number of vehicles going straight or turning left or right at an intersection) per day. Using this information, the county has altered its traffic lights so they change more efficiently. The first year that MetroTech’s technology was put into action, Santa Clara County eliminated 18,000 stops per day. Considering that the United Parcel Service could reportedly save $100 million per year if each truck cut one minute off of its drive time, this is a huge cost savings for businesses, governments, and commuters.